A thermal flaw detector developed at Tomsk Polytechnic University will be used in the manufacturing of a new aircraft to replace the AN-2. The new model fully consists of composite materials and is developed by the Siberian Aeronautical Research Institute S. A. Chaplygin (SibNIA), Novosibirsk, Russia. The thermal flaw detector developed at TPU allows technicians to detect structural damage to aircraft both during manufacture and operation. The development involves an advanced set of data processing algorithms, including thermal tomography and defectometry. Recently, it was exhibited at the 13th International Aviation and Space Salon MAKS-2017. "The aircraft is made of composite materials, mainly of carbon fiber reinforced plastic (CFRP). Manufacturers wanted to install non-destructive testing components for the construction of the aircraft. However, this caused some difficulties, since the methods established in Russia are mainly designed for metal structures. Conventional testing methods like X-rays are appropriate for metals, but they are either not suitable for composites at all, or suitable only for certain modifications. Therefore, the manufacturers faced a problem related to the testing methods they could put into the technological plan. The ultrasonic method will be used in any case, but apart from it specialists made a decision to use the thermal testing method developed at TPU," says laboratory head Vladimir Vavilov. The operation of the TPU facility is based on the NDT infrared thermographic method for the detection of damage in composites used in the aerospace industry. Boeing, Airbus and Bombardier widely deploy this method, which is still not common in Russia. 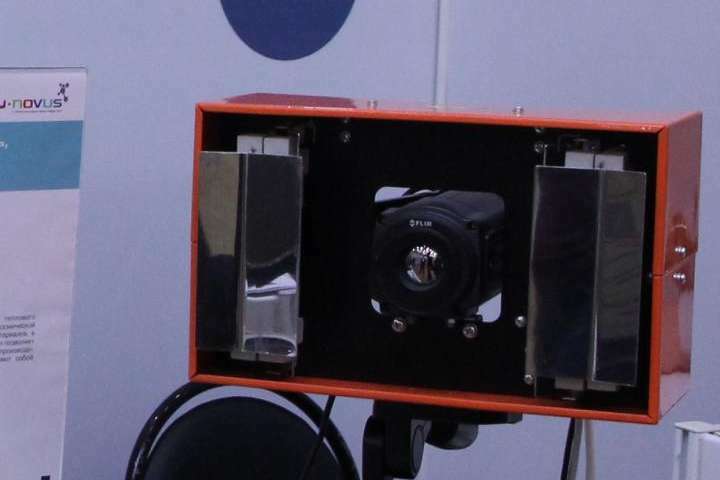 "At MAKS, we presented a flaw detector mainly intended for the conditions of hangars (when panels are taken off from the aircraft) or for one-sided testing (directly on the aircraft itself). During production, there is an opportunity to turn panels, to put them optimally, to get them from the other side, and so on. Currently, we are designing a modular flaw detector that can be modified to meet production needs," says the scientist, adding that the exit trial of the method is planned for October 2017.